It is a place where we find comfort. It protects our possessions, but more importantly it protects you and your family. Unfortunately, many homes are not as safe as they could be. Every 14 seconds a home is burglarized. 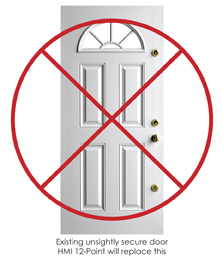 In more than 50 percent of all residential burglaries, entry is gained through a door. 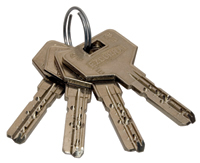 High quality locks and key control are your first line of defense against a break-in. 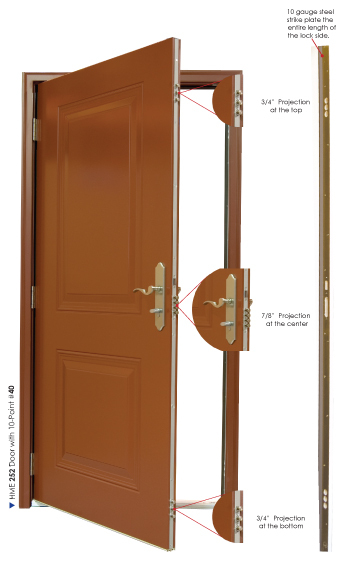 Designed for security the 3 point mortise lock is the perfect solution for 8 ft doors. The top and bottom locks help to stabilize these oversized doors from warping and give a better weather sealing performance. 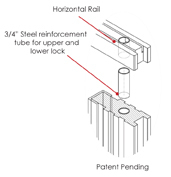 The top and bottom ¾” backsets are passive until the deadbolt is engaged. The 1” deadbolt backset is engaged by turning the key on the outside or thumb turn on the inside. When the deadbolt is activates the projections in the top and bottom locks to become a 3 deadbolt locking system. The stainless steel lock faceplate runs the full length of the door.